Barry Badger Squeaky Soft Dog Toy is an exciting toy that includes a terrific squeaker that will keep your dog entertained for hours. 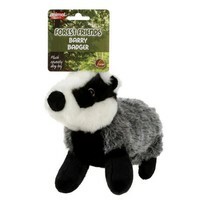 Made from a premium quality ultra soft fabric that is machine washable, Barry Badger is sure to be a hit with your dog. These soft toys are great. They have a good squeak in them and they appear to be pretty strong. My dog loves them and they seem to last a long time! This has so far lasted for months! All other soft toys have been chewed to bits, but this one has withstood the chewing by our Samoyed, and it is her favourite chew toy. That good that we purchased the fox too! my jack russell loves this toy so much he humps it!!! doesnt stand up so well to constant chewing but he'll be broken hearted if he loast it so buying more as spares! !